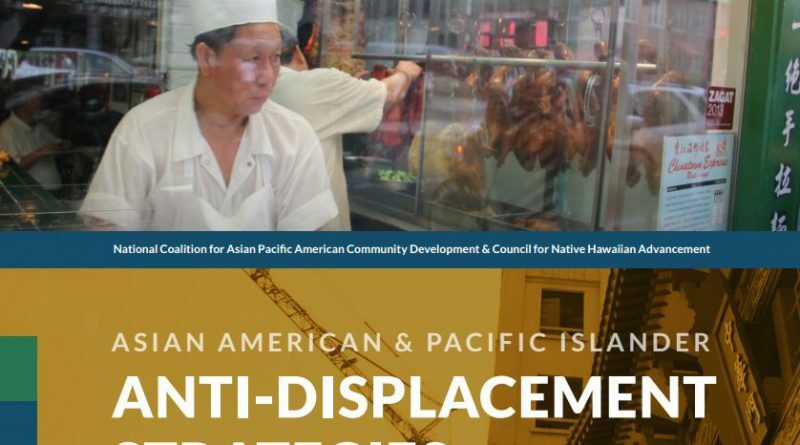 This commentary is adapted from the National Coalition for Asian Pacific American Community Development (National CAPACD) and Council for Native Hawaiian Advancement (CNHA) report on anti-displacement strategies, published on May 11, 2016. The full report is available on National CAPACD’s website. A new housing crisis is upon us, and is not so new. Our neighborhoods and economy are facing major transformation as working families fight for their right to cities and land. This commentary bears witness to the complex challenges of displacement and equitable development, and also highlights the innovative work happening on the ground to respond with the power of community activism. Throughout the history of Asian Americans, Native Hawaiians, and Pacific Islanders, struggles over land, power, and economic rights have shaped our communities and families. As communities of color were redlined, forbidden to purchase homes, and segregated into cultural ghettos for the larger part of United States history, native lands and ethnic neighborhoods served as spaces of survival. Our historic Asian American and Pacific Islander districts, once neighborhoods of opportunity next to downtowns, now find themselves on the verge of extinction, threatened by skyscrapers, transportation projects, convention centers, and sports stadiums on all sides. The arc of justice has opened opportunities, but the power of capital to displace remains the same. In this challenging moment, we also face opportunities and see our strength. This commentary features proactive and impactful strategies, tools and policies that expand the power of working families to shape the future of their neighborhoods, originally published in Our Neighborhoods: Asian American & Pacific Islander Anti-Displacement Strategies, a report issued in 2016. We offer these strategies as a beacon of hope when the power of profit-driven development appears insurmountable. Our intent is to link together these local efforts to generate a national conversation and to leverage our collective wisdom to shape policies across the country. Section one will present data about the state of our current crisis. Section two will highlight five organizations and programs that were successful in advocating for the preservation of their neighborhoods. Finally, section three will present key policy recommendations for preventing the displacement of native lands and historically ethnic neighborhoods. Today, capital moves across the globe faster than ever, and the wealth gap continues to widen. Upper-income people are moving back to cities after decades of disinvestment, and low-income families of color are struggling to retain a foothold. Historic neighborhoods and small businesses are being overrun, and the rising ranks of those in poverty are the most vulnerable to evictions, foreclosures, rapidly rising rents, and unstable incomes. This presents a significant challenge for the AAPI community because the population is concentrated in large, urban areas where these housing trends have been particularly dramatic (see Figure 1). Figure 2 highlights trends in wealth and housing that paint a troubling picture of where our community is today. Rents and home prices in the selected markets have shot up since 2000, while AAPI incomes have not kept pace with escalating living costs, leading to displacement, overcrowding, and homelessness for thousands of low-income families. With 22 million more renters in metropolitan areas from 2006 to 2014, due to the foreclosure crisis, less economic stability, a preference for rental housing by younger populations, and limited housing stock, low-income tenants face tremendous pressure from landlords and predatory equity investors to move and make way for higher-paying tenants. The lack of any rent controls or eviction protections for small businesses can threaten the livelihood of entire neighborhoods and communities. AAPI median incomes in our neighborhoods are below the county Area Median Income (AMI) for the average household size, with several significantly lower. What we have found is the county AMI that HUD uses to assess affordability does not match what is affordable for a neighborhood’s current residents, preventing many low-income families from affording newly developed units. Additionally, market-rate housing construction prioritizes 1-2 person occupancy for highest profit, preventing families with children and multi-generation households from fair access. As the wealth gap widens, it appears some families whose businesses and jobs have catered to new, wealthier residents have done better economically, while more vulnerable, low-income AAPIs have fared worse. The decrease in middle-income households in most areas shows the widening wealth gap and the push out of the middle class from cities because of the availability of mostly luxury or dilapidated or restricted affordable housing. To create the 2016 report, our staff traveled to communities throughout the country to learn about what cities are doing to counter forces of displacement and to create thriving neighborhoods. Where we saw neighborhoods that are surviving amid drastically changing cities, there were always decades of intentional organizing and policy wins that created the relative stability and preservation of affordable housing stock. Here we present five case studies out of the twenty-four that were featured in our original report. Hawai’i homeowners saw a 687 percent increase in home foreclosures between 2008 and 2010, resulting in a loss of $15 billion in home equity. Mainstream lenders utilize loss mitigation tools, such as principal forgiveness, interest rate reductions, and loan term extensions, to reduce mortgage delinquencies in the state and ensure borrowers are able to sustain affordable monthly payments. loan modification underwriting services, and housing assistance loans. A total of 78 native Hawaiian homeowners have secured loan modifications to prevent lease cancellation on Hawaiian trust lands with the average homeowner seeing a $457 reduction in their monthly mortgage payments. Overall, the HCA’s homeowner program has helped preserve $4.1 million in home equity for native Hawaiian families. As one of the West Coast’s technology centers, Portland, Oregon, has rapidly gentrified with a disproportionate displacement of communities of color, within the historic context of highly segregated and exclusionary policies in the state (Illustration B). Oregon was one of two states with bans on inclusionary zoning to increase affordable housing. When Portland’s planning and sustainability commission opened up public comment on its drafted comprehensive plan in March 2015, the Asian Pacific Network of Oregon (APANO) and twenty-one other community groups organized to compile a package of eleven land use strategies for inclusion that would fight displacement and expand access to affordable housing for the next twenty years. All eleven have since been integrated into the comprehensive plan after the coalition showed up to each public meeting with signs, visuals, and testimony, urging officials to choose the path toward an equitable future. Center equity in community involvement policies and eliminate disproportionate burden on underserved groups. Expand the impact analysis tool to anticipate displacement and how development affects affordability, and ensure urban renewal plans are designed to strengthen existing residents and businesses. Require mitigation for displacement and the impacts of development on housing affordability, including 10,000 affordable units by 2035. Use community benefits agreements as anti-displacement tools. Capture value from development to fund anti-displacement tools. Use land banking as an anti-displacement tool. Include permanent affordable housing in market-rate developments. Protect tenant rights through education and enhanced inspections. Use reconstruction overlay zones to redress past harms. Implement anti-displacement measures in mixed-use zones. Importantly, the plan emphasizes the city addressing past wrongs and injustices and includes the right to return and restorative justice, particularly for Black communities who have been most displaced. APANO and advocates successfully overturned the state’s seventeen-year ban on inclusionary zoning this year, while APANO is engaged in place-making and stabilizing the Jade district—a 20,000 Asian and Pacific Islander community—through equitable transit-oriented development along the bus rapid transit line. Located right next to Downtown, Little Tokyo and affordable housing has been squeezed by development pressures of new office buildings and redevelopment projects, which destroyed about 1,000 affordable SRO housing units for Japanese-American seniors (Illustration C). Rather than react to each project through opposition and strife, in 2013 Little Tokyo Service Center (LTSC) and the Little Tokyo Community Council held a three-day charrette with over 200 residents to envision the future of Little Tokyo, which created the sustainable Little Tokyo vision and plan to ensure the neighborhood’s economic, environmental, and cultural livelihood. Ensuring development and the built environment support the health of residents, including graywater projects, bicycle and healthy transit infrastructure, a mini-solar electric grid, and the development of the last three major public parcels for green infrastructure, affordable housing, and small businesses. Education and community engagement initiatives to involve seniors, youth, and other residents in the process and projects placing community self-determination at the forefront of sustainability. Arts and cultural pathways to preserve the neighborhood’s history and creative life. The large Hmong refugee community has worked over many decades for political, economic, and cultural representation and power in the Twin Cities, and other Asian and Pacific Islander communities remain minorities often underserved in economic development initiatives (Illustration D). After branding the Little Mekong neighborhood in 2012, the Asian Economic Development Association (AEDA) decided to build on local assets to bring life to the business and cultural district by creating innovative intergenerational collaboration between artists in the Twin Cities region and immigrant small businesses. The annual Little Mekong Night Market was established to preserve cultural arts and brings together AEDA’s two strongest anti-displacement strategies: technical assistance for small businesses to economically flourish, and creative arts as a draw to the neighborhood to highlight its Hmong, Vietnamese, Thai, and other Southeast Asian and diverse communities living in the area. In its first two years, the Night Market has been a citywide success, bringing 15,000 residents from throughout the region in 2015 to learn about local restaurants, enterprises, and cultural institutions. Artist Kao Lee Thao was invited to paint community murals and public art over three years, building visions to activate a new Little Mekong plaza, in partnership with Hmong American Partnership, St. Paul Riverfront Corporation, and the City of St Paul. A series of Artist Happy Hours and MANIFEST pop-up arts, culture, and food events intimately engage over 100 artists at each event, including fashion designers, musicians, visual artists, and poets, to make Little Mekong a creative hub for the Twin Cities. will offer artist studio space, incubate community-based social enterprises, and provide a cultural co-working space to develop artist entrepreneurs and cultural groups to build their capacity and economic sustainability for themselves and the neighborhood. Over 280 artists draw business to over 50 vendors at the Night Market, and throughout the year continue to partner to bring attention to the services and goods offered along the light rail corridor. Advocates estimate that there are about 100,000 unregulated basement living units in New York City, mostly in the boroughs of Queens, Brooklyn, and the Bronx, which accounted for nearly 40 precent of new housing from 1990 to 2005 (Illustration E). In Flushing, Queens, a study conducted by the Chhaya Community Development Corporation (CDC) found that 82 percent of homes had illegal conversions, with about 35 percent safe enough to legalize. Many of these units are rented by immigrants, who may not be aware of building code requirements prohibiting unsafe conditions where there are limited windows or exits in case of fire. In one of the most expensive cities in the country, basement units are often one of the few affordable housing options. These families are more at risk of eviction, illness, and hazards, and their status makes them more vulnerable to housing and economic exploitation. Homeowners can face fines up to $15,000, are more at risk for foreclosure within unstable income, and the process of legalization is difficult and can cost anywhere from $10,000 to $45,000. City legislation to establish protocol and a task force across city departments of fire, buildings, planning and housing. Zoning changes on floor-area ratio, parking, and housing type. Building code equivalencies and a new unit to inspect and certify the basement units. Finance mechanisms tied to affordability incentives, including tax abatement and developer credits. The case studies demonstrate that development and investment should be shaped and led by longtime residents who are able to both stay through and benefit from the redevelopment of their communities. Based on extensive discussions with community advocates, residents, and policymakers, the 2016 report presented a number of national policy recommendations for combating displacement that remain important now more than ever. A federal hot markets program to prevent displacement. Create a federal cross-agency hot markets program to address displacement of low-income renters, small businesses, and cultural districts. Implement equity in transit-oriented development Ensure existing residents and community businesses benefit from equitable transit-oriented development investments rather than be displaced. Meaningful community planning engagement & benefits. Require funded community engagement processes in any publically supported or tax credit-development projects, including work with local community organizations, impact scorecards, and a baseline for community benefits. Land equity and self-determination for native Hawaiians. Ensure inclusion of native Hawaiian beneficiaries in Hawaiian homes trust land programs. Mitigate climate change displacement. Call on federal agencies to further investigate the impacts of climate change on the displacement of Compact of Free Association (COFA) Pacific Islander communities. This is about more than geography—this is about the shape of our identity, our spirit and wellbeing in a place we call home. These neighborhoods and homelands are places where community building happens, where social networks for survival and economic collaboration are built, and where we find joy, celebration, and family. The National Coalition for Asian Pacific American Community Development (National CAPACD) was founded in 1999 by practitioners across the country to be a voice for the housing, economic, and community development needs of our diverse and growing AAPI communities. With over one hundred members in nineteen states, the National CAPACD created the only AAPI-serving HUD housing counseling network in 2010, facilitates asset-building and small business technical assistance, and brings members and allies together to strengthen the capacity of community-based organizations to create neighborhoods of hope and opportunity. The Council for Native Hawaiian Advancement (CNHA) was founded in 2001 to unify and build the capacity of Native Hawaiian organizations. The CNHA’s mission is to enhance the well-being of Hawai’i through the cultural, economic, and community development of Native Hawaiians, through policy advocacy, community convening, leadership development, grant training and intermediary services, providing access to capital, and linking resources and solutions to community challenges. The CNHA is a HUD-certified housing counseling agency and a Native CDFI certified by the US treasury department. For information on the remaining case studies, please refer to the National CAPACD and CNHA report. Bocian, Debbie Gruenstein, Wei Li, Carolina Reid, and Roberta G. Quercia, “Lost Ground, 2011: Disparities in Mortgage Lending and Foreclosures,” Center for Responsible Lending, 2011. Please refer to the full report for a more nuanced discussion of each of the recommendations enumerated above. Additionally, current available data to measure displacement and equitable development is insufficient. The report, thus, made recommendations to help governments, advocates, and residents ensure fair housing is being furthered. Please refer to the full report for a complete list of data-related recommendations. The National Coalition for Asian Pacific American Community Development and The Council for Native Hawaiian Advancement. “Asian American & Pacific Islander Anti-Displacement Strategies #OurNeighborhoods.” Asian American Policy Review 27 (2017): 51-61.